Fat Prince, located at Peck Seah Street in Tanjong Pagar, is a cafe by day, and a bar by night, and with food and drink offerings liberally embellished with Middle Eastern influences. Opened September by the same team behind fusion Japanese izakaya bar Neon Pigeon, Fat Prince feels like an intoxicating hybrid of a classy European cafe and a traditional coffee bar in Istanbul. And while its sister outlet combines Japanese influences into its food and drinks, Fat Prince draws its inspiration from the culinary cultures that comprise of the Middle East region into its menu. In fact, their drinks program is possibly one of the most unique in Singapore. For example, the wine list features wines from Lebanon and Morocco, countries that do make wine but are not widely known for that fact – the Chateau Kefraya Blanc de Blancs ($19++ per pour, $95++ for bottle) from Lebanon, or the Alain Graillot Syrocco Syrah 2012 ($19++ per pour, $95++ for bottle) from Morocco. And how about beer? There’s the likes of 961 ($15++), a Belgian-style witbier from Lebanon, and when we visited, a shipment of Jordan’s Carakale had just arrived, brought in specifically by Fat Prince for their own bar. Fat Prince’s bar is managed by veteran barman Vegneswaran Ram (main picture) – previously of Long Chim Singapore and The Library – who puts together a splendidly creative cocktail menu spiced up with Middle Eastern ingredients and influences. 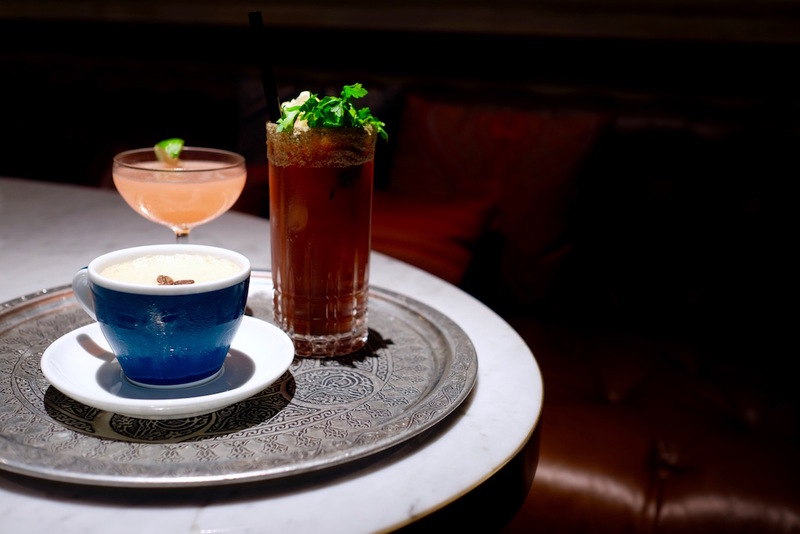 Consider the ubiquitous Bloody Mary, but in this case reinvented as the Moroccan Mary ($18++, above right) by replacing the tabasco in your traditional version with harissa, the chilli paste used widely in North African and Middle Eastern cuisines. Coffee fiends are likely to fall in love with the Hard Turkish Coffee ($20++, above, bottom left), which spikes traditional Turkish coffee – brewed on an open brazier at the bar filled with hot sand – with rum, and coffee and chocolate liqueur. Yes, it’s almost as thick and rich as the gritty non-alcoholic original. If you prefer something a lot more refreshing, the Kopek Tuyu ($21++, above, top left) blends a house-infused rum with sumac and anise, dark rum, Amaro Montenegro and lime juice that’s guaranteed to perk up your appetite. Speaking of appetite, Fat Prince offers modern takes on traditional Middle Eastern eats such as mezzes and kebabs. The cafe bar has somehow lured Chef Hunter J. Moyes, who was once on culinary reality TV show Chopped Canada, to helm Fat Prince’s kitchen. We’re big fans of the Truffled Baba Gahnouj ($12++), which is best eaten with the accompanying crispy flatbread, as well as Spicy Beef Adana (2 for $16++ or 3 for $24++, above), which wraps seasoned hand-minced beef onto the traditional flat iron skewer and then grilled over a fire, and served atop pita bread with pickled chili, smoked tomato sauce and onions macerated with sumac. A bar with great cocktails in a very accessible location that just so happens to serve fabulous authentic Turkish coffee – what more can we ask for? You can find Fat Prince at 48 Peck Seah Street, #01-01.